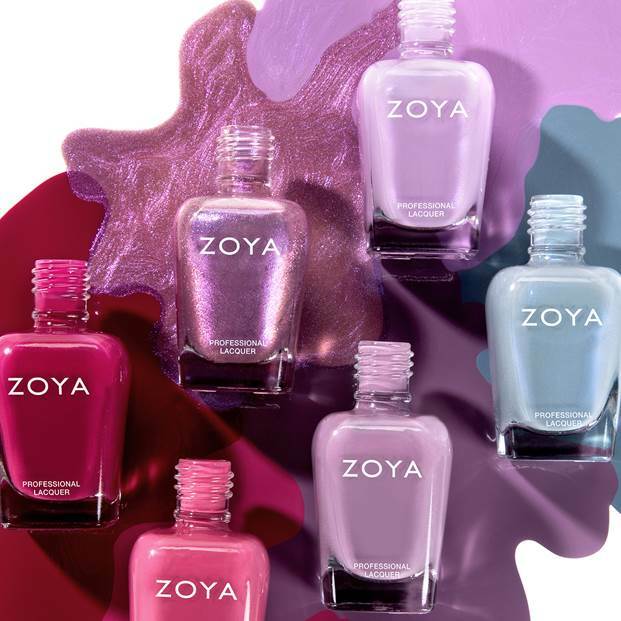 This February, Zoya is launching their Spring 2018 polish line, the Zoya Thrive Collection. This collection is available for pre-order now, and the collection will be released on Feb 15th. Hello lovelies! 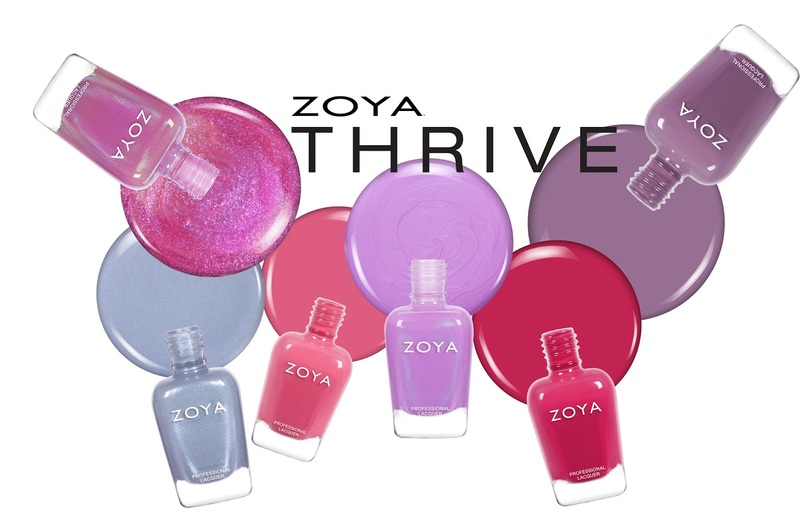 Today I am so excited to share with you the beautiful new spring 2018 Zoya Thrive Collection! I was guessing they would have another collection coming out since the Bridal Bliss collection was mostly a curated collection. As with all of Zoya's collections, these are all 10 free and cruelty free. When I first saw the promo image for this collection, I was super surprised because at you can see, this is not a "typical" spring collection. When I think spring, I think brights, neons, shades that you see in nature when the sun finally comes back out, but these are dustier than you would expect out of a spring line. I am all for pushing the boundaries and I was pumped to get these polishes on the nail. The Zoya Thrive collection consists of 6 new shades, and they are an "emergence of color from a dusty gull gray metallic to a vibrant lilac purple" and then a purple flaky topper. DARBY | Initially I was so confused by this color, it is described as a "dusty, gull gray metallic", but to me, this is more of a dusty light blue/gray with a royal blue flash. I never would have thought to wear a polish like this in the spring time, at first I thought it had to be a fall color, but it grew on me over time. As you can see, the blue shimmer flash is much more apparent in the bottle, but you can see it slightly on the nail under the right night. This was 2 coats. TRUDITH | This is a muted purple creme, and again, not a color you would think of seeing in a spring collection. This is not the most unique color for my collection, but this is a nice purple creme polish if that's what you're looking for. The formula on this one was a crelly, but built up really nicely. This was 2 coats. BRANDI | Here is your typical blush creme polish, not something that I usually like, but this shade actually looked great on my skin tone. This was probably the toughest formula for me to deal with, and the first 2 coats went on a bit patchy for me. After that, I had some visible nail line which prompted me to need a third coat. That being said, this is a nice flowery pink color, and it will definitely be one that I will throw into some nail art this spring. This was 3 coats. Look familiar? I thought so too. A comparison post will be coming soon on my blush creme polishes! 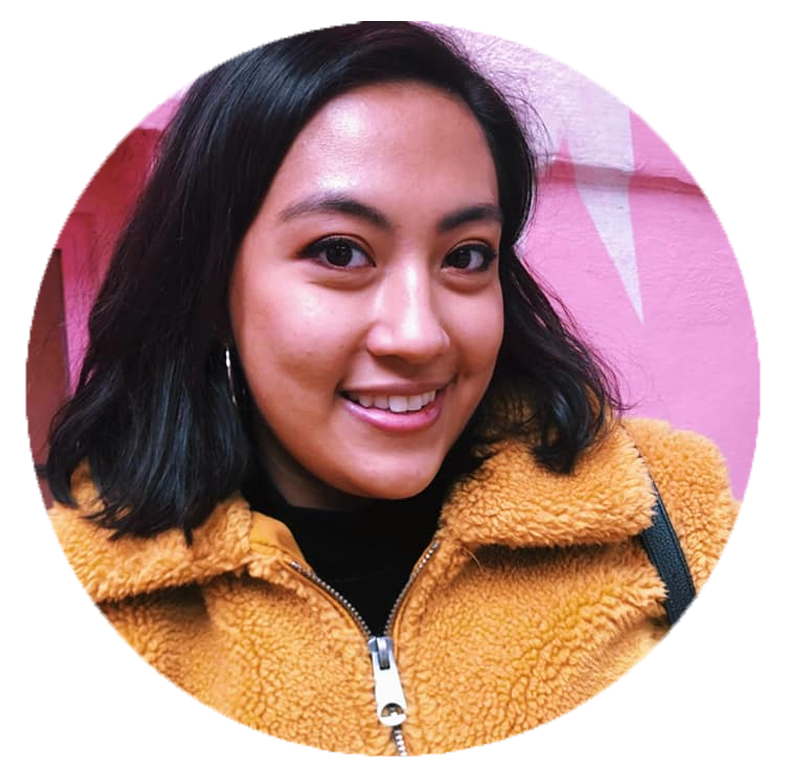 MONROE | Okay this name though... this super saturated dark pink creme is truly the most 'spring' shade to me in this collection. This was another crelly formula, but it went on super smooth and did a great job at covering some of my nail imperfections (which can be hard to do with a crelly formula). This was 3 coats. LEISEL | This is one of those shades that is just so hard to photograph. This is hands down my favorite color in the collection, and it is meant to be used as a purple flaky topper, but I just layered it on its own for these pictures (and love how it came out!) I am not the biggest fan of layering polishes, but that fact that I could build this up on its own makes it a keeper for me. This was 4 thin coats to build up the flakies. HARUKO | This soft lilac color is packed with an ultra violet flash, and this is another color I loved so much. Unlike 'Darby', you can really see that purple shimmer on the nail. Not only is is playing right into the color of the year, but it's such a delicate purple that I can't wait to wear! This was 3 coats, but you could get away with 2 if you have a less harsh nail line. So, initially, I was not super stoked by this collection, but I was intrigued. Not all of these shades were stellar for me, and not all of them were new shades, but I did love Leisel and Haruko so so much. And if you have been around my blog long enough, I normally don't wear pinks on their own, and will only use them in nail art -- so you can expect that from these two pinks since they did have really nice formula and were both creme polishes. As expected, the formulas on these are really nice, build-able, and weren't too hard to apply. Want to pick up these shades? You can pre-order now here, and they will ship out Feb 15th.